Capsugel has a premier set of technologies, expertise and infrastructure to meet the evolving challenges faced by biopharmaceutical customers worldwide. Extensive experience in formulating and advancing thousands of difficult compounds has provided us with the expertise needed to address low bioavailability and other formulation challenges. As every compound and development program is different, we focus on product design and provide a tailored approach to optimally meet our customer’s specific target product profile and commercial objectives. At Capsugel, we apply deep product design and technology expertise to successfully advance challenging compounds, and improve overall speed-to-market. Capsugel designs, develops and manufactures innovative products for pharmaceutical customers. Key focus areas include drug design and development based on enabled formulations for improved bioavailability and drug delivery. We develop a full range of innovative, solid oral dosage forms inclusive of specialized tablets, mini-tablets and multiparticulates encapsulated in capsules or sachets, powder in capsules, liquid-filled hard capsules, and softgels. Capsugel has formulated and advanced more than 4,000 compounds addressing a myriad of problem statements, and Capsugel’s product-development sites have more than 70 years of collective experience producing clinical trial material. Capsugel provides full analytical-method development and validation in support of formulations for clinical-trial materials and commercial products. We have analytical staff located at each of our integrated product-development sites, which helps ensure rapid feasibility assessments as well as optimized product design and development. Our unique combination of high-quality science and engineering expertise is core to Capsugel's expertise. We have developed proprietary technology selection methodologies, predictive models, expert systems, formulation reference tools, specialized equipment and micro-testing methods to help ensure rapid feasibility assessments as well as optimized product design and development. All clinical trial materials have exacting manufacturing, storage and distribution requirements. Capsugel offers integrated customer assistance throughout the entire product-development process, addressing these crucial post-manufacture issues at its current Good Manufacturing Practice (cGMP) facilities worldwide. Capsugel is the global leader in capsules and encapsulation technology. For more than 100 years, biopharmaceutical companies have relied on the quality, consistency and functional innovations Capsugel has delivered; today Capsugel produces more than 200 billion capsules for approximately 4,000 customers in over 100 countries. Capsugel offers new generation of capsules specifically designed to meet the needs of a rapidly growing population of patients who have difficulty swallowing. The number of inhalation formulations for nasal and pulmonary drug delivery continues to grow, driven by the prevalence of respiratory diseases. Capsugel offers novel inhalation drug-delivery capabilities based on proven particle engineering through spray-drying, as well as specially designed capsules for use with dry-powder inhalation devices. As the leading global gelatin-capsule manufacturer, Capsugel understands the unique benefits of gelcaps better than anyone and works closely with clients to help transform their brands. Capsugel’s Press-Fit® and XPress-Fit® Gelcap proprietary technology enables caplets to be enrobed with high-gloss gelatin covers that patients prefer. Building on our history of innovation in polymer science and capsule engineering, Capsugel continues to launch ground-breaking capsule and equipment designs that are improving drug development and delivery. Moving a compound from the lab all the way to the pharmacy presents numerous challenges. As part of Capsugel’s innovative approach to supporting clients’ development efforts, we can eliminate headaches and streamline operations at key points in the clinical-trial process. Three of our capsule products use technology specifically designed to support the needs of preclinical and clinical trials: DBcaps, PCcaps and Colorista™ Capsules. Significant challenges exist in achieving targeted drug delivery and providing enteric protection for drugs that are heat- or acid-sensitive or cause gastric irritation. 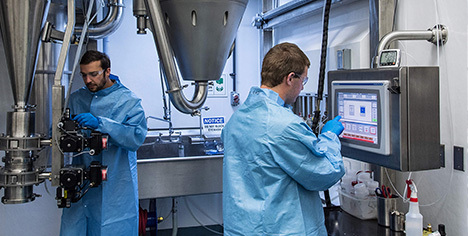 Capsugel has combined its proficiency in polymer science and capsule engineering to develop a line of intrinsically enteric capsules that preclude the need for enteric coating.